Defender/Shieldguard: of course, you can't have a Dwarven faction without sturdy Dwarven warriors. The look nice, will probably be a good solid core unit. No problem here. Next! 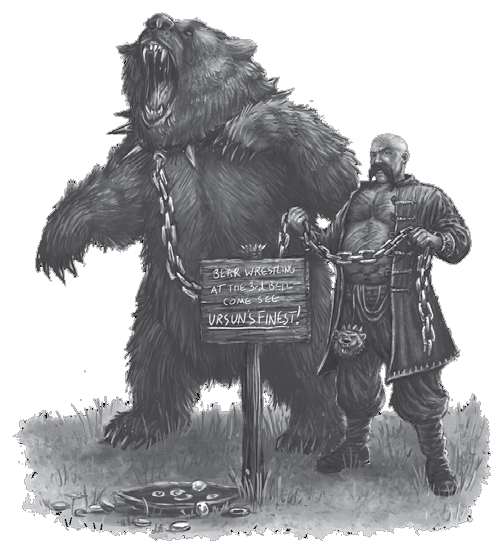 Bear/Blackbear: Fair enough; a non-humanoid unit that makes sense appearing in a faction that belongs in a foresty/mountainy environment. Kobold scout/Kobold pathfinder: All right, at this point I'm assuming somebody at Limbic had been drinking tequila for half the day and suddenly discovered that they needed another core unit. After first going through suggestions like llamas, buffalos and flying condors, a voice cries out: "I know, guys... guys, you're gonna love this: hamsters. We need hamsters." Or is it a beaver? I can't tell. While the gameplay might work out fine, I do believe we have seen the replacement for the Kappa as the most ridiculous creature in the series. Dis/Valkyrie: Limbic are from Germany and they seem to love Germanic folklore and mythology. "Dís" is actually Old Norse for a form of female spirits or goddesses, the most well-known of whom was the Vanadís (dís of the Vanir, the gods of Vanaheim), also known as Freya. Valkyires are also creatures of Norse/Germanic (if you're confused, don't worry; the Norse and old Germanic cultures are closely related, hence the sharing of beliefs) lore; they were the "death wights", or a kind of "angels of death" if you will. They would pay attention to the warriors in battle at the behest of Odin (Wotan in Germanic), choosing who should fall and then carry them off to Valhalla. Names aside, such units fit well in with the Northern mood the developers are setting for this faction. Rune priest/Rune patriarch: Big guy, big hammer. What's not to like? Lava elemental/Magma elemental: Dwarves being natural miners and mountain-dwellers, I guess it makes a certain amount ot sense that one of the creatures is a wild boar/rhino made from molten rock. I just wonder what the reaction was when the first one appeared in front of the dwarf who dug it out of the ground. Can't have been pretty. 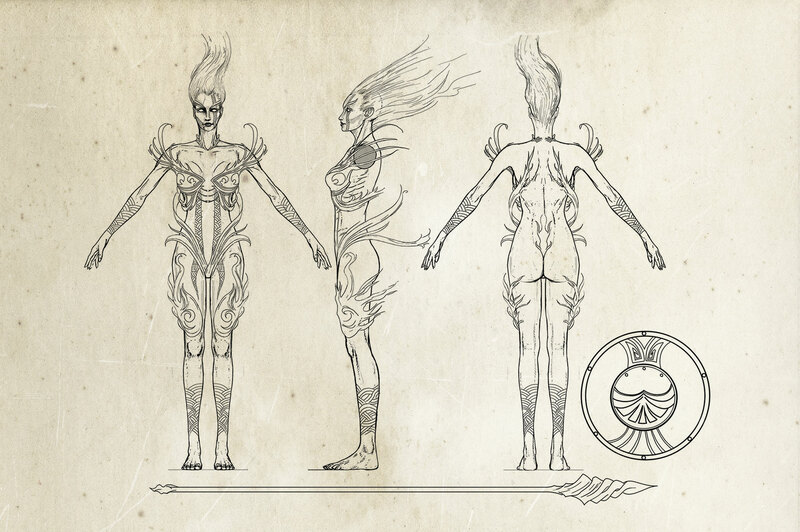 The description hints at this creature having some form of charge ability, setting nearby creatures on fire as it passes. I wonder if it can burn down town gates? Fire giant/Einherjar: The first sounds like something out of Baldur's Gate 2, while the second is once again taken from mythology. "Einherjar" is the plural form of the Norse word "einheri", and that is what you call the man fallen in battle who is taken to Asgard by the valkyries. So aside from the dwarves, there's a hamster, a bear, a searing rhino-thing and a couple of supernatural beings. Runes will probably be massively overpowered, and the lore runs the risk of turning everything into a feast for Marvel fans. Can anything salvage this faction? Red dragon/Ardent dragon. ... Yep. That'll do it. Whatever that is, it's certainly not a kobold. "Although usually invisible, a kobold can materialize in the form of an animal, fire, a human being, and a candle." And it looks cute and it's better choice then another Dwarf with a crssbow. Too bad explanation behind it is... as usual - beastman created from fusion of a Dwarf and a rodent. Same with Giant and Valkyrie - another Dwarves. At least this line-up is much better then in Heroes 5. Instead of 6 Dwarves and Godzilla we have 2 Dwarves (5 if you count Kobold, Valkyrie and Fire Giant), a bear without Dwarf, Lava version of H4 Frenzied Gnasher and Smaug. It's like H6 Dungeon after H5 where they toned down the dark elves, now they did it with dwarves. Nival's legacy barely lives. i think it was a good move in both cases (and in Sylvan case too). Nival's Dungeon was not only a copy of Warhammer Dark Elves but also had strippers. And it has just too much elves in general. H5 Fortress had 7 Dwarves (6 units + hero) and big, fiery, lizardry "Snow White". While Dungeon or Sylvan had too many Elves as units, Fortress was even worse. 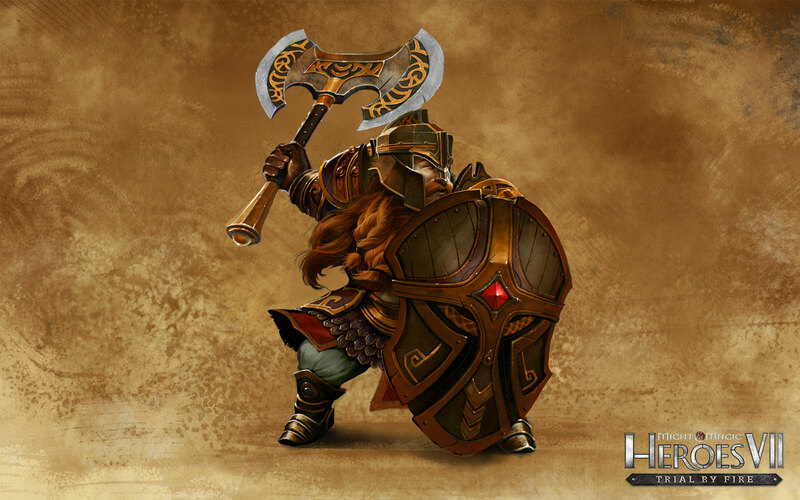 While H7 Fortress still is Dwarf-oriented town (according to lore behind creatures), at least this time units don't look like: Dwarf with harpoon, Dwarf with hammer, Dwarf on bear, Berserk Dwaf, Dwarf with staff and overgrown Dwarf. Danny wrote: Nival's legacy barely lives. Lol, what about NWC's legacy? You know, the dudes who created the freaking game. Certainly not a beaver - look at his tail... or actually the lack of it. There is some truth to this, but I am not convinced. This hamster thing is just too much and then there is the Boarhino. And in HV everybody were complaining "WHY DO WE HAVE GIANTS IN A DWARF FACTION?" (with which I didn't had problem, cause it is only fair to mix those races (see Disciples II)), now we have TWO (I assume) giant creatures. And one dwarf. Couldn't we had, like, a Bear TAMER instead of just a bear? To me it sounds better than rider, cause those looked ridiculous in HV (my opinion). The Boarhinos'... oh, God... at least it is implied they have a nice ability there, so I'll wait and see. Not impressed, though (STILL BETTER THAN THE HAMSTER). To sum-up: a faction of DWARFS with only 1 dwarf unit, 2 giants, 1 chica (after all they have to reproduce, right? ), 3 (let's call them) animals and 1 dragon. Really dwarfish! Oh, and isn't it only makes sense for the chick that brings the guys into Valhalla to be above them in the line-up, as superior being? I guess one can argue with this, but it still bugs me. You can indeed argue with that last point, yes, because once they're in Valhalla, the valkyries are used as a kind of servant/waitresses who bring endless supplies of meat and mead to the einherjar. In fact they are servants of Odin, while the einherjar get to fight alongside the gods. Anyway, this is just a matter of details. I have to say I like the idea of a female dwarf; possibly as a ranged core unit. Do the lemmings have a "walk into abyss" specialty? Or will they behave on the battlefield like in the legendary Lemmings game? I'd like Worms with bazookas in inferno to balance them! EDIT. Uh, it upgrades to Lemming Pathfinder? Means that upgraded units do not walk anymore randomly into abysses? Glad to see that they didn't go overboard with the shoehorned female quota. I was sincerely fearing female dwarf warriors and stuff. Pitsu wrote: I'd like Worms with bazookas in inferno to balance them! That'd be awesome. Maybe with a banana bomb special? Right now I'm not excited about this faction, but that is more a result of the poor AI making the game generally uninteresting. I can't treat the werehamsters seriously at the moment. But neither do the Argent Dragons look all that formidable. Chances are, AI will make their stack wait at the end of the battlefield while your ranged attackers fire away. Or one 100% damage implosion will kill the entire stack. We really need a Quantomas for H7. Except for gourley4p, not many people can seriously play H7 with a straight face with the current AI. When the AI is sorted out, almost any faction, new or modded, will add value to gameplay. No, not hamsters... I think they are anthro groundhogs. Seriously, of all the stupid misinterpretations of kobolds, this is the WORST. Even worse then some anime where they became gnolls/werewolves. That said, it's not as if I was looking forward to the town of all-dwarves that stole the name of my favourite HOMM3 town, anyway. Also, I do hope this means Bill Murray will be a playeable dwarven hero, cursed to repeat the same level, same turn, over and over again. At least that'd make this funny. Also, seriously? the Red dragon, which was always a precursor of the black, is now... a DWARVEN unit?!? WUT? Also, a HUMAN valkyrie, and a fire giant, in a dwarven town. I am glad they are not boring 50 shades of Dwarf again like in HOMMV, mind you, but these are some rather odd choices. I hope the warlocks will sue about the dragons. At this point I feel apart from a few old timers like us, no-one remembers. I'd gladly kickstart someone doing an old-style Heroes game, they can name it differently, but they could use Enroth, Erathia, the old names - since Ubi never cared for or used them, ever, apart from Crag Hack and Sandro. Heck, just yesterday I played a bit of H3HD, and man I missed that game. Heroes 7, I not only uninstalled already, but even deleted my saves and the download. I want to see no trace of it on my PC. They just HAD to include some scantly-clad, supermodel-bodied female creature in the lineup. If we go by dwarves,and them being the angels carrying their dead to the afterlife, wouldn't it have made more sense to make them female DWARVES?